Paperversary — Paper Rose Co.
Mark your first (or any) wedding anniversary with a one-of-a-kind gift that will last a lifetime. 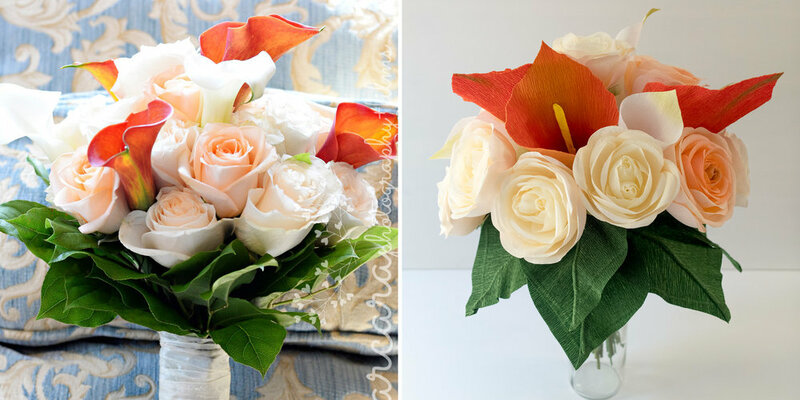 I often think about recreating my wedding bouquet—with all the time (and money!) spent fine-tuning the details—it's a shame I only got to enjoy it for a few hours. So when a friend contacted me about recreating her bouquet and mentioned the paper anniversary—everything clicked! Obviously, I'm not the only person in the world who wished they could have held onto this key memento of the day—and what a perfect occasion to bring it back to life! And hence began my foray into the world of Paperversary Bouquets! Since sharing that first official paper anniversary project, I've been steadily helping couples celebrate, and I can easily say these are some of my favorite projects. Given the increasing number of requests, I thought I'd make this process a little easier on everyone by separating it out from my other custom orders. Use the form right here on this page. After I receive your request, I'll ask you to send me a photo (or more if you have them) of the bouquet or wedding flowers you want to recreate. Using the information you've provided, I'll respond with a detailed project estimate and set timeframe for delivery. 3. Pick an option, pay, and relax. Once we've agreed upon a scope for the piece, I'll set up a private listing (right here on this site) so that you can check out and pay for your project. At this point, your work is done! 4. Using your photos as my guide, I’ll work my magic. Upon payment and according to the schedule, I begin making your piece. Once the project is complete I'll send you final studio photos, instructions for handling, and a gorgeous arrangement ready to be gifted! 5. Win spouse of the year! When was your wedding date? If there's anything else you'd like to add, go for it! I'll be in touch shortly to request photos and any additional information needed to put together a project estimate. Now would be a great time to track down those images if you don't already have them handy! I price all anniversary bouquets strictly by the stem—which start at $15 a piece. I do not charge a design fee for these projects since I'm not the one designing them. (You already paid for that part!). That said, I do put a lot of extra attention into these pieces, and they are typically composed of highly customized blooms that I work hard to get just right. Given the scale of traditional wedding bouquets, I typically propose two options—a full-scale replica and a slightly-smaller choice, or one that I design with a few cost-effective swaps. That way you can decide what you want to spend. Bottom line, as of April 1, 2018, I request a minimum of $250, and after a year of working on these projects, I've found that have found that most bouquets fall between $275-$500 for an accurate recreation. Ideally, I like to plan these projects at least a month out. But I also know that things happen, and sometimes people forget about anniversaries until say… oh I don't know… a week ahead of time! (It happens to the best of us.) Send me your information, and I'll see what I can do. I typically arrange the flowers and tie them with ribbon so that they do not require any preparation once they arrive. Pieces like this can easily be displayed in vases or almost any type of container (they don’t need water! ), so I leave that up to you! In some cases, I've recommended that stems be kept separated or loosely tied as I've finalized my work. (Sometimes pieces look perfect as is!) I will always share my suggestions and ideas as I go and you can decide how to proceed. If you have keepsake vases or special requests, I'm happy to discuss. And I can always source vessels and make other accommodations as well. For shipment, I swaddle the entire bouquet in tissue and heavyweight wrapping paper. It’s all gathered at the bottom into a “handle” so you can present it as is (like a Miss America prize! ), or wrap the entire box up as you like. What if I want to surprise my spouse and I don’t have any pictures? Believe it or not, you wouldn't be the first! I worked on this piece for a man who was deployed and wasn't going to be able to spend his first anniversary with his wife. Between wanting to surprise her and not having regular internet access, I pieced together inspiration based on where they got married and his description of their wedding colors. Not bad, right!? Moral of the story—we will make it work! What if I don’t want to recreate the actual bouquet? There are no rules here! Take this one as an example—where Peter and I focused on the centerpieces lining their reception tables and ended up with a gorgeous gift that his wife absolutely loved! Or this one—where Ann picked out some of her favorite blooms from her daughter's flower farm wedding to create a collection of heirlooms. I can answer this question better by showing than telling. Below is a collection of my most recent Paper Anniversary projects. I also write posts about these projects, which you can find on the blog. Terry & Carol’s Paperversary Reveal! Still not sure I'm the right Gal for the job? Check out these posts for more details, photos, and Convincing. Stephen and Amanda’s Paperversary reveal!